Welcome to Moonglow Lodge -a warm, whimsical retreat on mysterious Caddo Lake. Our three cottages are on Taylor Island, on the west side of the lake in Uncertain, Texas. 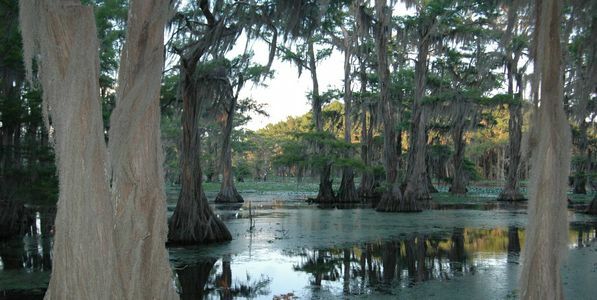 The only natural lake in Texas, Caddo Lake is a wetland of international importance, and a rich habitat for exotic plants, birds, and wildlife. Towering Cypress trees laced with Spanish moss, backwater bayous, shadowy sloughs, and swooping blue & white herons give it a haunting, primordial beauty like no other place in the world. Please make reservations via the Internet only. Email us at info@moonglowlodge.com for other information or phone us at 903-789-3940; please phone during office hours, 8a-5p, 7 days a week. Our mailing address is 144 N. Mossy Brake, Uncertain, TX 75661. For other information our phone number is 903-789-3940; please phone during office hours, 8a-5p, 7 days a week. Our mailing address is 144 N. Mossy Brake, Uncertain, TX 75661.